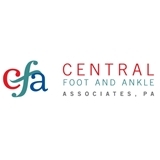 Central Foot and Ankle Associates, PA (Pearland) - Book Appointment Online! Doctors Linda Nachmani and Maria Bertorello have lived and been in practice in the Houston and surrounding areas for over 16 years. They both have held multiple positions in their local professional societies as well as served as clinical instructors, involved in lecturing and teaching surgery to residents in training. After many years of group practice, the doctors decided they had a different vision for their practice. They wanted to stay ahead of current technology and surgery while still maintaining a practice that was caring and a comfortable environment to be in. Too hot in the office, staff was great!